Been So Long is set in London with a R&B and U.K. dance soundtrack. 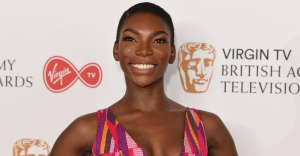 Netflix has bought the worldwide rights to Been So Long, a new musical movie starring Michaela Coel. The film is currently in post-production and tells the story of a single mom (Coel) who meets a man (Arinzé Kene) on a night out in Camden, north London. Screen Daily broke the news of the acquisition and they state that the movie was picked up in a "multi-million dollar deal" believed to be Netflix's largest single acquisition of a U.K. film in its history. Been So Long is directed by Tinge Krishnan with a supporting cast that includes Game Of Thrones actor Joe Dempsie plus George MacKay, Ronke Adekoluejo, Luke Norris, Ashley Thomas. A release date for the film is TBC. The film's soundtrack was described as featuring "a diverse mix of R&B, soul, U.K. dance, and cinematic orchestration" in a press release earlier this year. A release date for the film is TBC. Coel recently confirmed that she has no plans to write a third season of her series Chewing Gum and is "focusing on other projects" instead.